Adding lining to a custom window treatment adds an additional expense, but it’s well worth the investment. Below are some of the advantages to linings. 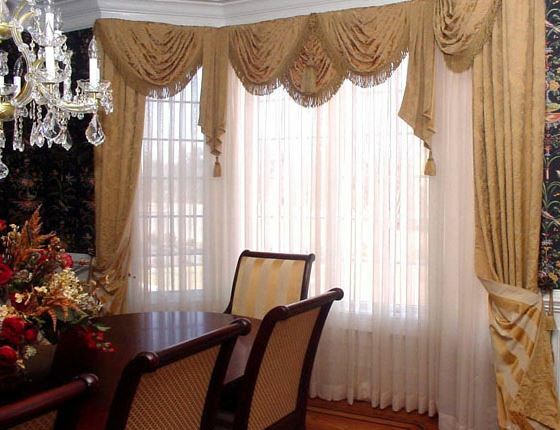 By adding a lining to drapes, it creates a more finished look from the inside. The lining helps block sunlight that can make fabric colors look washed out. And from the outside, white or ivory linings can give varied window treatments a crisp, uniform look. Linings help drapes hang better, particularly drapes that are made out of a thin fabric. When the drapes get wet, a lining can help resist staining. For many custom drapery projects, we use a special, stain-resistant, polyester-cotton blend of fabric. Window treatments with linings last longer. And if the linings should wear out, replacing them is a fraction of the cost of replacing drapes. Thanks to linings, the fabric of the window coverings is protected from the sun, and with the amount and intensity of sun we get in Colorado, it’s almost essential that you add linings to custom drapery treatments. Many people choose to add linings to custom drapery because of the additional insulation they provide. Linings can help keep a room cooler in the summer and warmer in the winter. For extra insulation, we can use a special lining with a fleece-like interlining on the back of it, essentially creating a three-layered drapery. All types of drapery lining will serve to block out some light, and we also have special “blackout” lining available. Most people opt for blackout linings in window treatments for home theater rooms, media rooms, and bedrooms. Some of the most beautiful fabrics don’t actually provide much privacy, particularly at night. Adding lining can increase the opacity of the window treatment, which is highly desirable for bedroom and bathroom coverings. Some condos in the Denver metro area have HOA restrictions on the color of window treatments, often requiring neutral colors. With linings, you can conform to the homeowners association rules by adding a white or ivory lining that will be seen from the outside, while still having complete freedom to choose whatever color you like for the draperies. To receive more information about linings, or to get a price quote on your next custom project, please e-mail contact@draperyworkroomdenver.com. Please make note: We can offer to stock your lining in our drapery workroom in Castle Rock, or we can provide you with a wide range of lining options, at reasonable prices. We offer free pickup and delivery.